Located in a charming little Istrian town, set in a maintained fully enclosed garden, Villa “E” is a modern villa. Villa “E “ is ideal for two families and accommodate up to 8 guests in 2 double bedrooms, where one have en-suite bath, plus one four-bed room with two bunk beds. The entire Villa is on ground floor level with an modern kitchen, dinning and living room leading out to the large covered terrace. From the terrace you have view on the large pool, the mature green garden and the Italian mountains. The close proximity to the sea (3km) and city crowds (4km), yet tucked away in an idyllic countryside setting will offer a peace and tranquility that will make your holidays in Villa “E“ an unforgettable experience. Price per week in april 1000 € and in may 1150 €! 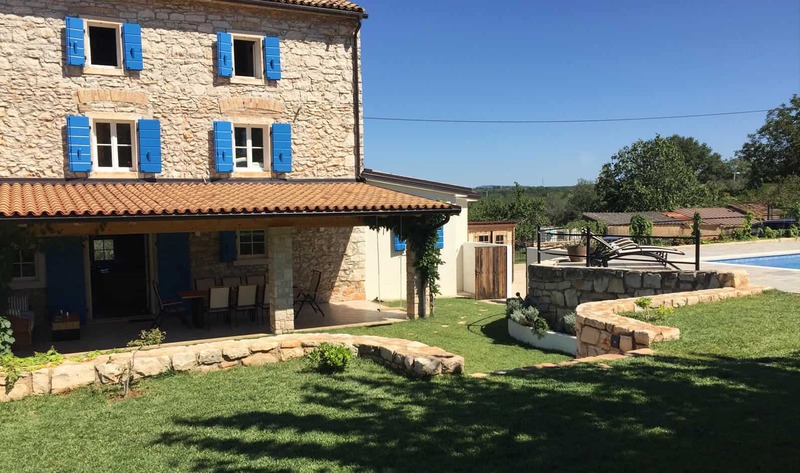 Located in a little Istrian town set in a beautiful and fully enclosed garden, Villa Flavia present itself as a newly restored traditional Istrian stone house. Villa Flavia can accommodate up to 10 guests in 4 bedrooms, 3 of them with en-suite bath. The ground floor with the modern kitchen and living room leads out to the covered terrace facing the lower garden level. The large pool can be enjoyed from the Lounge area. The close proximity to the sea (3km) and city crowds (4km), yet tucked away in an idyllic countryside setting, Villa Flavia offers peace and tranquility that will make your holidays an unforgettable experience.